"Cat carriers come in handy for so many reasons: emergencies, vet visits, moving..."
A cat carrier is very helpful in getting your cat from place to place. Probably the most regular use of one will be for visits to the veterinarian. Almost all veterinarians require that your feline friend be contained in something when coming in for an appointment. Assuming you have a healthy cat and only need to take her to the vet for her annual exam, then you will probably only use it once a year. Other reasons you could need a pet carrier include traveling, moving, or any other reason you may need to safely move your cat from one place to another. Perhaps the most overlooked reason to own your own pet carrier is in case of an emergency. Emergencies could range from your indoor cat eating a poisonous plant (but hopefully there are none of these in your house! ), or your cat going outside and getting hit by a car and you need to safely and quickly transport him to the emergency veterinary hospital. Taking your cat to the veterinarian in a small enclosed area will help your already traumatized cat feel more safe and secure. Other emergencies that will require a safe and sturdy way to transport your cat include fires, and depending on where you live, earthquakes, floods or other disasters that will require you to leave your home quickly. I stress these potential emergency situations because I've read other people's recommendations that you should simply borrow a cat carrier for those rare trips to the veterinarian. However, in case of an emergency, you will not have enough warning and you must be prepared to take care of all your pets immediately. You should own your own and keep it in an easily accessible place in your home. This could make a significant difference in taking care of your cat in an emergency situation. Multiple cat carriers are necessary if you have more than one cat. Make sure that each of your kitties has their own enclosure. Which type you choose could depend on how often you think you'll use it, and of course, your own (and even your feline friend's) preference. Do you hope to only use the carrier once a year for your kitty's annual physical exam? Do you move a lot and need to transport your kitty more often? What are your storage space considerations? Remember, you should keep this essential cat supply in an easily accessible place in case of an emergency. And you should be able to get to it immediately. When choosing a carrying enclosure, be sure to pick the right size. You want to make sure that he or she can stand up and turn around and also stretch out while lying down (especially if you're traveling a long distance). However, you also want to make sure that it's not too big. Cats feel more secure in smaller areas. Bigger is not better in this case. If you're adopting a kitten, you may want to start with a cardboard carrier until you know how big your cat will be in adulthood. Then, if you like, you can make more of an investment to get something stronger and more permanent. If you adopt your pet from an animal shelter, almost all shelters will give you a cardboard enclosure to transport your kitty home. If you are bringing a new cat home from somewhere that does not provide one, be sure to take one with you to pick up your new family member. A cardboard cat carrier is usually fine for your healthy cat if you plan on keeping her indoors and don't plan to travel much. It will have holes for ventilation and to allow your cat to see out. Cardboard carriers are all very similar in size. And you can flatten them if you need to save space. Until I got a two-door carrier for my healthy cat, I used the cardboard version. My kitty was okay with it, but I've heard and read a lot of stories of other kitties chewing through the cardboard, so they may not be the best for most cats and kittens. Soft pet carriers are generally made of a firm but flexible material. They will last longer than cardboard carriers. If you plan to travel any distance with your cat, a soft cat carrier may be a better option than a cardboard carrier. You can also take some soft carriers into the passenger part of an airplane with you (never let your cat be transported in the outside luggage compartment of a plane, as this is too traumatizing and unhealthy for your cat). If you plan to fly, be sure to check with the airline about the acceptable size for your carrier. Different airlines may have different requirements, and some airlines don't let you transport pets at all. Another advantage of the soft carrier is that unlike cardboard, a soft carrier (as well as a hard one) may be better in case of an emergency. For example, if the cardboard should become wet, then it will be useless to you. Also, some cats will tear their way out of the cardboard due to stress or other reasons. Depending on the flexibility of the material, you may also be able to collapse the soft carrier to save space while it's not in use. A hard cat carrier is the sturdiest of all available pet enclosures. It's usually made of a tough, durable plastic. Regular hard carriers take the most in storage space in your home, as they are less flexible than cardboard or soft carriers. Petsmart used to carry an excellent fold-away cat carrier, but as of 2008, they no longer do and I haven't been able to find another company with this great cat supply. 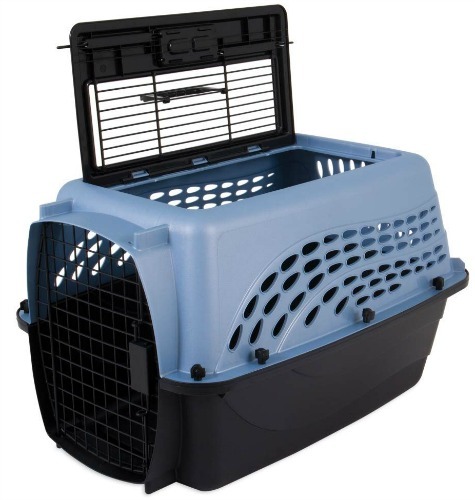 If you have enough storage space in your home and your cat doesn't mind going in through the front door of the carrier, a standard hard carrier is a great option for this critical supply. It's sturdier and will last longer. Many cats will look like cartoon characters with all four legs stretched straight out sideways when you try to put them into a cat carrier. To avoid this aversion to being boxed, you need to get your cat used to the idea of being in the carrier. This is especially important in case of an emergency when time is of the essence. If the only time you pull out your cat's carrier and try to put your cat in is once a year for her annual visit to the vet, then your cat may not be too thrilled about being put inside. (Interestingly though, most cats who raise a stink about going in at home, will act like dead weight when you try to take them out at the vet's office!) Although, you will hopefully only need to use your carrier once a year, in case of an emergency, it will be very helpful if your cat goes easily into the carrier. One way to introduce your kitty to a new carrier is to leave it in the middle of the room, or other place where it's easy for her to get into. You can try throwing a couple of healthy treats inside. Your goal is to get your cat to explore the carrier and become familiar and comfortable with it. Ideally, your cat's experience with her cat carrier will be a pleasant one. Some cats become so accustomed to their little enclosure that they sleep in it or use it during their playtime. 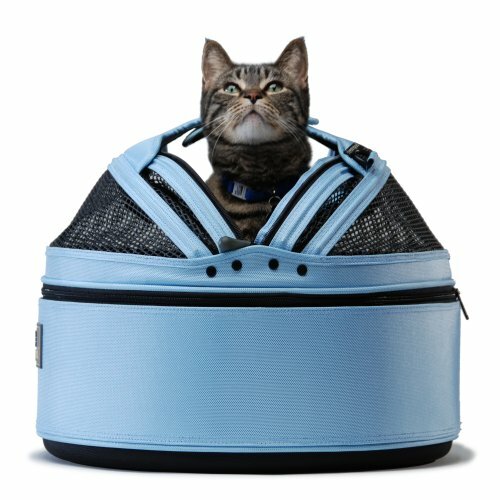 I just found this new cat carrier-cat bed combo that cats love and will make trips to the vet so much easier than before. It's called the Sleepypod Mobile Pet Bed. Not only is it versatile and comfortable for your cat, but it also saves space by serving two purposes: cat carrier and cat bed! Didn't find what you're looking for? Use this Search Box to find more information. Or visit the feline articles below. Our Cat Supplies article provides a list of essential supplies and some great places to buy them. CatsPlay has a wild selection of luxury pet furniture and supplies that you might find fun and useful.